Sen. Kamala Harris said Thursday that she will vote against confirmation of William Barr, President Trump’s nominee for Attorney General of the United States. “I do not believe he will defend independent investigations from attacks, embrace a smart on crime approach to public safety, and ensure equal protection under the law for every single American,” Harris said. Barr served as Attorney General under President George H. W. Bush from late 1991 to early 1993. Since then he has been a corporate counsel and litigator for top law firms. 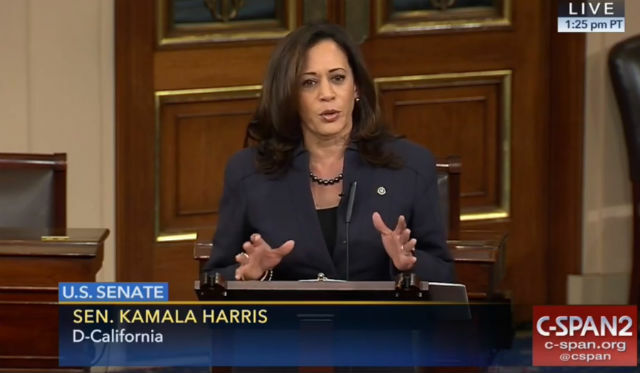 “With a criminal justice system that disproportionately harms communities of color, Mr. Barr continues to express support for the same failed policies he encouraged in the 1990s when he effectively advocated for mass incarceration,” Harris said. If confirmed by the Senate, Barr would succeed Atty. Gen. Jeff Sessions, who was forced out by Trump after months of public criticism by the President.